Many wearers were satisfied with the support implemented by the Scott Palani SPT. One user stated the shoe delivered a comfortable ride. The shoe had a nice amount of cushioning yet still lightweight, according to a wearer. It felt like a high-quality shoe despite its low-price tag, some consumers praised. A runner appreciated how the outsole was useful in giving adequate grip on both rough and smooth pavements. A user complained that the shoe was stiff where rebound was needed, yet floppy in areas that required support. Another commented the heel cup felt too squishy and loose. A couple of buyers reported the toe box was small and felt too rigid. Numerous consumers felt that the Scott Palani SPT came through with its promise of giving stability, as many users were impressed by its performance. However, there was a negative reception from other wearers regarding the shoe’s structure and design elements. 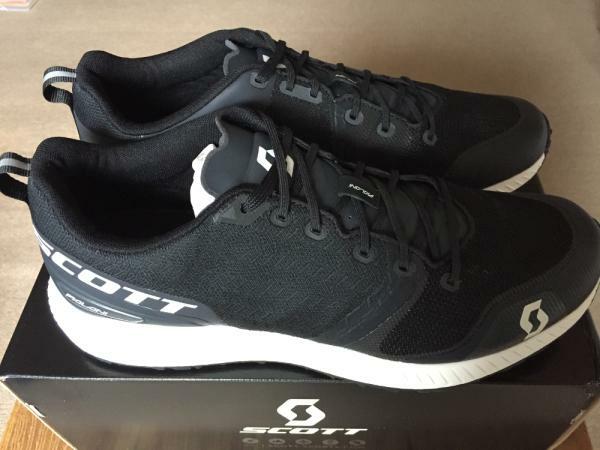 I was thrilled to be given a chance to review shoes from Scott, courtesy of Scott & RunRepeat. Scott was a brand I was familiar with through skiing but whose running product I had never had the opportunity to try. The Palani is also unique in that it is the first road-specific offering from a company known more for mountain and trail heritage. Palani is billed by Scott as "performance shoe for fast training sessions." It has 11mm drop and weighs in at 280g, which is about average for daily trainers but heavier than the 220g of Palani RC racing shoes. Styling – the shoes don't look like your regular running shoes. I had recently reviewed Brooks Revel for RunRepeat, shoes which were billed as "lifestyle" in that they suited casual wear as well as running. Well, Palani actually trumps Revel in the casual look stakes. The all-black colorway certainly helps, or perhaps it's the one-piece outsole in black rubber, with no hint of flex grooves or guides, or maybe the non-mesh upper material. The upper is made of "woven quarters" according to Scott website. I'm not sure entirely what that is but it helps to visualize the upper on, say, canvas sneakers, so nothing like the soft breathable mesh (or even knitted) upper more commonly used. Even the tongue is made of a thin filmy material with minimal padding, contributing to the casual look. Rocker midsole – the midsole is quite striking in the way it tapers towards the toebox from a fairly generous rearfoot. This is accentuated by the way the midsole has been oversized in the heel area, not so much in terms of stack height but the way it protrudes beyond the upper. For those that are familiar, think more Under Armour Fat Tire than Hoka Clifton. The chevron etchings on the side are a nice design touch and I think looks great. Both the looks and rocker midsole caught the attention of running friends when they saw me wearing Palani for the first time. "They look like street shoes," said one. "Whoa – what's going on here?" Said the other when he put them on and stood up. The shoe rock – literally – but more on that later. The fit – When I initially put them on I thought I had the wrong size. They were too loose, especially in the front part of midfoot. Now, I don't have the narrowest feet – in fact, I am on the wider side of average. Using thicker socks and adjusting with the laces made the shoes just about snug enough to run in. Thankfully, the heels locked in fine. A bit of research revealed that Palani uses the "Road" last which is shared with Palani SPT and is designed to "support the rear foot while allowing for mid and forefoot stability." The Palani RC, on the other hand, uses the "RC" last which is "race specific for faster running." My take on this is that the Road last used on Palani is cut more generously for comfort over longer distances and daily training. But – the use of thinner, non-plush material for upper and tongue means the shoe lacks that foot-hugging feeling we are used to and the shoes end up feeling too loose. Oh yes – the tongue. It seems a minor point and almost trite to comment on running shoe tongues since for the most part they remain hidden and barely noticeable, but at the same time when you do notice it, it's because something isn't right. I didn't like the tongue on the Palani: too short, too little padding, too much thin PVC and not enough plush cloth. Not a biggie, but I also found the woven upper to breathe less and tend towards hot on warmer days. At any rate, the shoes had arrived a few days before a local half marathon, which was going to be the occasion to properly test them out, but now in the wake of the loose fit, I began questioning that decision. Partly because of a sense of duty and partly because a couple of short test runs actually went OK, using the chunkiest socks I had, I did end up using the Palani for the half. This leads me to the one thing I like most about Palani – the ride. Although not broadcast as such on the shoe itself, Palani makes use of the eRide rocker sole, which Scott has used since 2010. Scott had in fact added Running to their Cycling and Winter sports line-up way back in 2006. I suppose a benefit of being a latecomer, particularly from different disciplines, is a fresh perspective and willingness to innovate. In fact, other relative newcomers to running shoes, Pearl Izumi and Hoka in particular, have used rocker soles to success. On feet, the Palani are firm. Probably the firmest I've come across. But once running, they don't feel hard at all as the sole smoothly helps transition from heel to forefoot through the gait cycle. Although I can't back it up empirically, I actually felt as if my cadence had increased as well. I found the ride (or eRide, to be specific), a real pleasure, almost addictive. Despite having at least another half dozen shoes at hand at any one time to choose from, I found myself reaching for the Palani time and time again. This is despite having suffered a small blister on the bottom of my left big toe at the half marathon. The blister could have been due to the loose forefoot or simply because the shoes were pretty much fresh out of the box. Or because the route included several downhills hard to tell, but I know that I do love the ride, and the blister/hotspot hasn't recurred. Scott describes Palani as a "performance shoe for fast training sessions" and that the "eRide midsole geometry combined with the Aerofoam Infinity foam increases running efficiency for heel strikers, midfoot and forefoot runners alike." I would very much second those comments. In summary, although slightly disappointed by the fit and couple of other minor points such as the tongue, the amazing ride wins out and for me, the shoe is a keeper. The rocker sole, great for running but a bit cumbersome when walking, actually don't stop me from using the shoes casually as well, thanks to the street-style design. The woven upper, while running a little hot, actually accentuates the street style. I've since used Palani for other shorter races, including a 5k and a 10k, and it's not failed to seemingly help me run better, if not actually faster. I also have a pair of Kinabalu RC (which fit much better) and can't wait to start testing those, as well as other offerings from Scott, including Supertrac RC and Palani RC. If the Palani is anything to go by, I think the company is onto something. The Scott Palani is an odd combination of a daily trainer and an uptempo performance running shoe, combining the less favorable properties of both. The Scott Palani is a high-quality shoe, however, it did not perform very well during testing. The upper consists of five distinct sections. The plastic toe cap, the breathable mesh in the forefoot, the same breathable mesh overplayed by plastic, a midfoot wrap, and a plastic heel cup. The only part of the shoe that is breathable is the forefoot mesh. As such, this is a hot shoe. The mesh in the front feels comfortable enough while wearing socks, but it is not comfortable if you like to run sockless. The midfoot wrap is smooth and soft. It is very comfortable against the foot, however, it is not breathable. The Palani has a very substantial heel cup. The heel cup provides great support and enhances the fit. The heel collar is heavily padded. There is actually too much cushioning in the heel collar. Scott should taper back on the heel padding in future iterations of this shoe. The tongue and lacing system is neither comfortable nor functional. The Palani has a very thin plastic tongue, which has no padding at all. This would not be a problem if the shoe had a dynamic lacing system that distributed the pressure from the laces well, but the shoe does not have anything like this. The Palani has very thin laces that cause pressure points on the top of the foot. The laces are laced through holes in the midfoot wrap. This works fine in terms of lockdown, but it is nowhere near as good as the Saucony Isofit system or any other lacing system. The sock liner has a unique rough texture. The Palani has my favorite sock liner of any running shoe. It feels very good on the foot and has more wicking capabilities than the standard sock liner. The Palani has a little toe bumper. The toe bumper is a piece of rubber on the front of the shoe and a plastic wrap around the toe. The toe bumper makes the Palani capable of light trails more than the standard road running shoe. The Palani has a standard straight fit. The fit is not very adaptable; if you do not have a standard shaped foot, try it on first. There is plenty of room in the toe box for proper toe splay. The midsole was very disappointing. The midsole is made of a thick piece of Scott’s Aerofoam, underneath a strobe board. The Aerofoam is extremely firm; it provides very little cushioning. It is also quite heavy. The Palani’s midsole feels like a racing flat since it is firm and responsive. The problem is that I would never dream of racing in the Palani because of how heavy the shoe is. The Palani has an 11-millimeter drop. This is quite substantial. The 11-millimeter drop is more geared towards heel strikers than forefoot strikers. When you heel strike, a high drop increases your turnover rate. When you forefoot strike, the extra cushion in the heel gets in the way. The Palani would be geared towards heel strikers, but the midsole is so firm that heel striking is uncomfortable. The Palani is a very stiff shoe. This gives it a more responsive ride. Stiff midsoles take a lot of energy to flex, but they really spring back when you toe off. The stiff midsole also makes the Palani a little bit less comfortable. The Palani’s midsole works well on trails. The thick firm midsole provides great protection from rocks and roots. The Palani has an outstanding outsole. The outsole is made from a single sheet of sticky rubber with small multidirectional lugs protruding from it. The outsole provides great traction on wet roads and light trails. 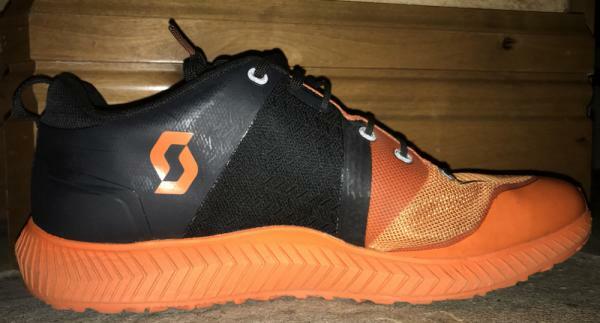 The outsole has enough surface area to feel comfortable on roads yet it still bites on trails. The Scott Palani does not particularly excel in any area. Racing: The Palani has a race-like feel. It is very responsive, but it is way too heavy to truly feel fast. Daily Training: The upper has enough padding for comfortable daily training, and the Palani has a high-quality durable construction, however, the midsole is too firm for the shoe to be a comfortable daily trainer. Trail running: The firm midsole, toe bumper, and outsole make the Palani suitable for light trails. The bottom line is that although Scott Palani is a high-quality shoe, there are other running shoes on the market that completely outperform the Palani in every area. Take the Hoka Clayton 2 for example. It works better than the Palani as a daily trainer, an uptempo racing shoe, and even a trail running shoe while at the same time being 3 ounces lighter. At 140 dollars, the Palani is not cheap either. Overall, the Scott Palani is a high quality, good looking shoe, that turns out to be quite impractical. The Scott Palani SPT is a running shoe for the roads, and it offers support and stability through various components. It is ideal for overpronators or runners who have a moderate to low arch, those who need little arch support. Presenting a no-sew construction, the upper brings a seamless fit that makes it lighter and more flexible than traditional stitched materials. The midsole is made from AeroFoam Infinity, which allows a seamless heel-toe movement and a responsive cushioning. Underneath it is an outsole that consists of a durable one-piece rubber; it delivers durable traction encourages running with a confident gait. The sizing of the Scott Palani SPT runs big; the shoe is available in a variety of sizes. Wearers are recommended to get a half-size smaller than their usual running shoe. The heel, midfoot, and forefoot construction will fit runners with a narrow to medium foot volume. Width profiles are available in D – Medium for men and B – Medium for women. With a one-piece, full-length textured rubber, the outsole of the Palani SPT delivers an increased grip. The external part of the platform also employs Efficient Traction, which is the brand’s signature concept that lets runners feel secure and comfortable, thanks to an accurate profile that rolls efficiently on flat surfaces and finds traction on gravel and smooth trails. The shoe also uses eRide Flow, which features a strategic flex pattern to guide the foot through the gait cycle, ensuring an even and capable stride. The AeroFoam Infinity technology makes use of an injected material that equips the midsole with durability and responsiveness, especially for the road and hard-pack trails. It also allows for additional cushioning that serves as protection on hard surfaces. The AeroFoam Infinity protects the body from the rigors of extended training runs with its shock-absorbing property, but not at the expense of the efficiency of the eRide geometry. The eRide is a rockered midsole structure that promotes an energized and fast running style, as it creates a stable mid-stance and converts impact energy into propelling motion. It works with the body to improve a dynamic running position regardless of running gait. With a two-tone mesh upper, there is a comfortable and secure sensation supplied to the foot. The internal lining is also made of open-weave mesh to guarantee air circulation. A quarter support cage is present to create a supportive package by securing the midfoot in place. An injection-molded heel counter wraps around the heel to create a stable platform. A no-sew toe guard is installed to protect the toes from injuries; it is lightweight, and it does not add to the weight of the shoe. There is a form-fitting protective tongue to keep the midfoot in place without restricting movement. The shoe’s construction is finished off with a road-specific last, which provides a snug, secure and stable feel that is optimal for road running.